has been the #1 choice of museums, art galleries and institutions for the preservation of precious items. Professional conservators, retailers, restorers and private individuals throughout the world depend on RENAISSANCE WAX to protect their collections and for in home use. Guard your precious pieces against the damaging effects of humidity, heat, dust, environmental destruction, aging and ordinary wear. 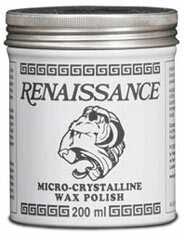 RENAISSANCE WAX provides a barrier against fingerprints and the devastation of water, wine, alcohol and other spills. With its high moisture resistance, it forms a durable, lustrous protective coating. Prevents tarnish, corrosion and "bloom;" remains completely waterproof, retards weathering on exteriors and objects exposed to climatic abrasion. and Lasts a Long Time! Excellent spread and indefinite shelf life make RENAISSANCE WAX economical and convenient, even for very large objects and infrequent use. A small dab goes a long way, unlike most waxes that need generous application. Use a minimal amount of RENAISSANCE WAX, rub lightly, and buff if a gloss is desired. The long-lasting preservation reduces the need for frequent maintenance. Airtight container keeps wax in perfect condition; always spreadable, no caking or drying out; indefinite shelf life; no "polish smell;" no added fragrance to endanger substrate material. Lift oil, dirt and the murky accretions of other polishes. The surface detail remains crystal clear through unlimited applications of this translucent wax; removes previous wax build-up; reveals fine detail & wood grain; non-staining, non-abrasive. Revitalize and return your objects to pristine condition. RENAISSANCE WAX buffs easily to a hard, transparent finish that will not discolor; Renews fading colors and "tired finishes;" retains matte finish when unpolished; buffs to a high gloss; reduces shine of new picture varnish. Furniture, Antique & New Sculpture, Porcelain, Pottery & Ceramics; Cutlery Knives, Swords, Armor; Jewelry, Carvings, Antiquities, Bibelots, Hardware, Wood Interiors, Fine Books, Clocks, Paintings, Oils, Acrylics, Gouaches, Tempera, Alkyds, Pastels, Oil Sticks, Martins Dyes, India Inks, Photographic Prints, Carvings, Engraving, Scrimshaw, Architectural Ornaments, PLUS; Automobiles, Boats and Yachts, Decoys, Golf Clubs, Firearms, Frames, Kitchen Cabinets, Counters, Appliances, and much more! Wood; raw & finished. Leather, Parchment & Paper. Metal; Silver, Silverplate, Gold, Copper & Copper Alloys (Bronze, Brass, Tin, Zinc, German Silver, Nickel), Lead & Pewter, Iron & Iron Alloys, Tin & Tin Alloys. Damascus; Stone, Marble, Onyx, Limestone, Granite, Brick, Tile, Terrazzo, Obsidian, Alabaster; Gems, Glass, Porcelain, Holloware, Bone, Ivory, Horn, Shell & Mother-of-Pearl, Gutta Percha, Dammars; Gilding & Gold Leaf, Patinas. Enamel, Lacquer, Japanning, Cloute, Pose d'Or, Pique Point, Varnish, Marbleizing, Stains & Artificial Graining. Plastics, Formicas, Paints, Polyvinyl Acetates, Esters of Polymethyacrylic, Polycyclohexanones, Fiberglas Epoxy Resins, and much more! UK: British Museum, Victoria & Albert Museum. Royal Armories (Tower of London , London & Leeds, National Army Museum, Imperial War Museum, the Wallace Collection, H.M. the Queen's Royal Armorer (at Marlborough House), the Guards Museum (Wellington Barracks), the Gurkha Museum (Winchester), the Military Museums at Aldershot, Royal Green Jackets Regimental Museum, the Gunsmith at Chatham Historic Dockyard (Kent), the Johnny Armstrong Gallery, and Museum of Border Arms & Armor (Scotland), National Museum of Antiquities of Scotland. Belgium: Musee Royal de l'Armee et d'Histoire Militaire-Brussels. USA: Gunsmith at Colonial Williamsburg, the Smithsonian, Metropolitan Museum of Art, Academy of Art-Honolulu, Texarcana College-Bladesmithing & Metallurgy, Rockfeller Restorations, and many many more institutions around the world.